The Frugal Family Life: $1/2 Flipz Chocolate Covered Pretzels Coupon! Here is a new coupon to print $1/2 ANY bags of Flipz Chocolate Covered Pretzels 4oz or larger! 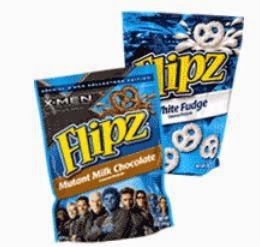 There is also an older link that seems to still be working for $1/2 ANY bags of Flipz Choclate covered pretzels 4oz or larger as well! I’m not sure the price of these, but if Nichols or Homeland carries them this coupon will double to take $2 off of 2 bags! It might make for a nice deal! I’ll check next time I’m in Nichols!